In my alt avatar I am working on a set of good links to builds around Second Life. It's a tremendously difficult thing to do, because I don't want to link people to things which would be inappropriate, dens of iniquity or outrageous commerce. It's hard to know where to draw the line, because many of the best builds in SL do have a commercial connection, whether it is malls and shops incorporated as part of the build, or a company connection. In the case of the Kindgom of Sand, which is a role-playing game, the sexual side of the game may offend people even while they are admiring the build itself. 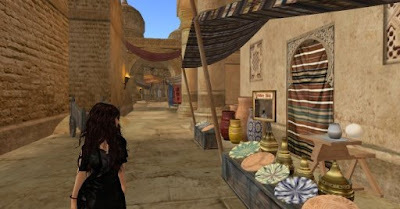 I am indebted to the blog "my so-called Second Life" for the slurl to this build in Purgatorio. The build is quite simply brilliant... really well textured and made. 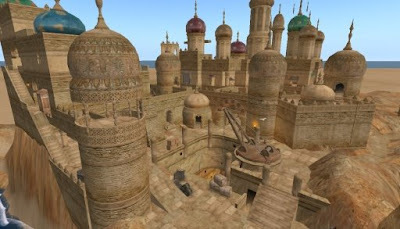 It is a fantasy Arabian city carved out of the desert, with turrets and minarets, docks, bedouin camps and dunes. The terraforming and texturing of the sand has been done extremely well, so well that it puts many sims to shame. They have used a set of textures over and over again within the build, but with such imaginative use of the variety of shapes and architecture that it never feels samey at all. I didn't gather much about the game except that it seems to be a master/slave fantasy roleplaying game in which the men are the masters and the women the slaves... although there was a male in a slave cage when I visited, so perhaps it is more varied than that. Exploring the sim with an explorer tag on makes one immune to capture and enslavement, and so I walked about taking photographs and observing the sim acivities. It was very popular - so popular that when I returned with a friend to show her the build, I could barely walk... we were pacing on the spot in many places. I admire the way that texturing has been used, and the attention to detail in the way that textures have been used... there is an accomplishment in composition and construction which is very rarely seen in SL, where the builder has worked within the constraints to make something that really works well. This is an object lesson in building a place that is interesting to explore, well textured, both realistic and a fantasy in one build. It is a great shame that the inclusion of the game may put people off visiting it, because it is one of the wonders of SL, and I am glad to have seen it. Hello! Baal Zobel (who is the builder) and I own Kingdom of Sand. I respect your discomfort around the game, but it is more laid back than you may think. It is not a gorean sim, and besides the basic rules, people set their own roleplay limits. - Golgothica: this is also a roleplay SIM, but you may get a guest pass at the entrance and visit freely. - Pathfinder Islands that is a new built (the inauguration party was 2 days ago!). It is a PG region, a beautiful place to enjoy live music, dancing, canoeing and relax with your friends.